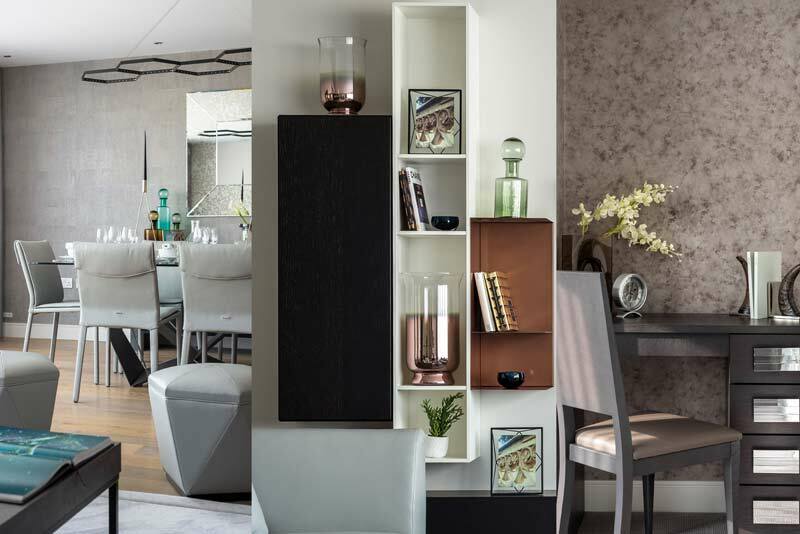 High-end rental properties always benefit from being both stylish and neutral; stylish so tenants don’t have to expend the time and energy creating a look, and neutral so they can project their own personalities onto the space. It’s a different matter when the property is serving as a holiday home as the space needs to feel welcoming, relaxing and personal. This change of use was the challenge that faced the team with an apartment at Chelsea Creek’s Doulton House. The client decided they would like to transform this high-end rental property into a stylish home from home with bags of character. Though the space was a blank canvas, that can often mean it is more difficult to visualise how it can look; and while the client’s only request was that it should be contemporary with a neutral colour scheme, the team knew that its three bedrooms, four bathrooms, large reception room and thoroughfares really needed to impress. An elegant grey palette was chosen for the decor throughout and this was accentuated by feature wallpaper in the bedrooms. Differing grey tones used in layers bring depth and touches of jade and teal highlight areas of interest. The materials used in the furnishings (including mirror, glass, lacquer, chrome and concrete) lend the grey tones a crisp, contemporary edge. Finally, the clean, simple lines of the chosen accessories and furniture provide visual stimulation without looking cluttered. The overall effect is sharp design in a light and airy apartment. The bedrooms showcased soft furnishings in different textures, against a backdrop of patterned wall paper to create a homely feel that is familiar and comforting. 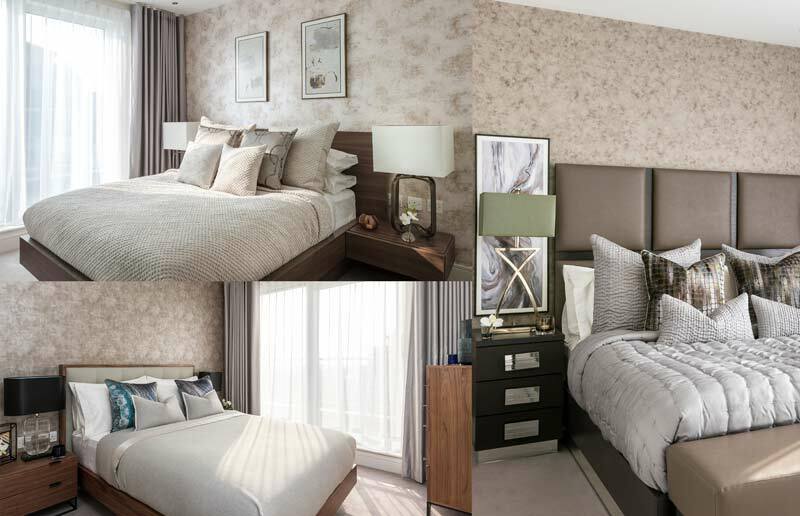 Using the same grey palette in all three bedrooms could make them seem too similar and a little cold but the designers ensured each room has its own personality; they used layers and textures of fabric and smart accessories to make the bedrooms feel both cosy and inviting. The rooms are unrecognisable from what they had been – the master bedroom for example was reimagined from an uninviting white room dominated by a large window to a soothing space with a pleasing symmetrical design and soft, billowing bedding to sink into. It was the large reception room however, that saw the biggest transformation. Plush leather upholstery for the dining seats and sofas provides a tactile contrast with the concrete-effect side tables placed around the room. The sharp lines of the Cattelan Italia glass-top dining table are shown to full effect against the muted grey tones. The design team played with light and shade using reflective surfaces; it is this same principal that makes the octagonal ottoman and Italian bar stools the show-stopping feature of the room. The design team has taken the informal, relaxed style of a holiday home and turned it on its head. 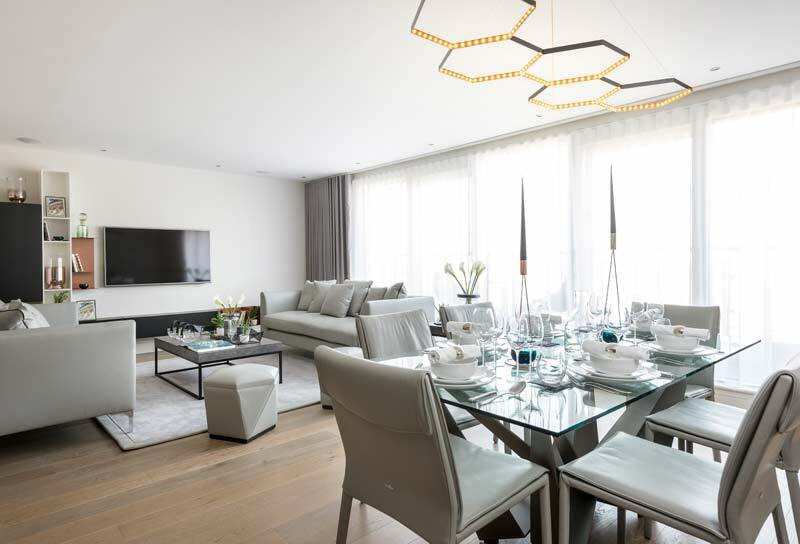 This apartment will make you feel instantly at home, offering comfort and sanctuary but also the ability to provide formal entertaining in the blink of an eye. It is this successful contrast of sophistication and comfort that ensures Doulton House delivers a city break in style. If you would like the ani M interiors team to give your holiday home the edge, get in touch today.